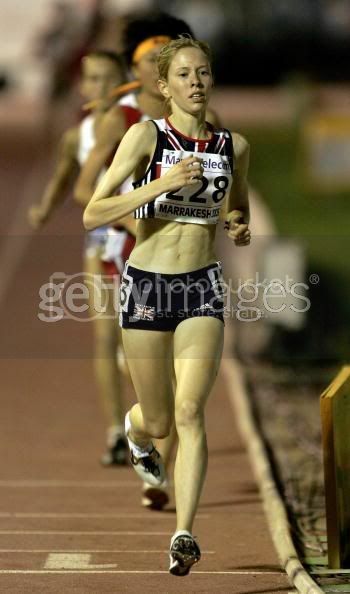 At the Midlands Junior Championships in Birmingham Sian was second in the 3000m in a time of 10:16.4. She went on to win the bronze medal at the English Schools Track and Field Championships in Gateshead, in a time of 10:02.89. Sian won the silver medal in the AAAs Under 17 3000m in Sheffield in a time of 10:03.22. The Under 17s showed that they could mix it with the athletes in the older age group, filling three of the top six places. 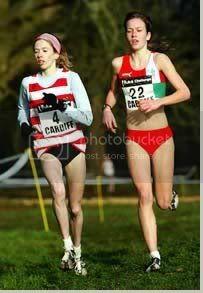 Under 20 Claire Holme, who during the race had built up a 50m lead at one point, came home in 17:50 just three seconds ahead of fast finishing Under 17 Sian Edwards (Kettering Town Harriers). 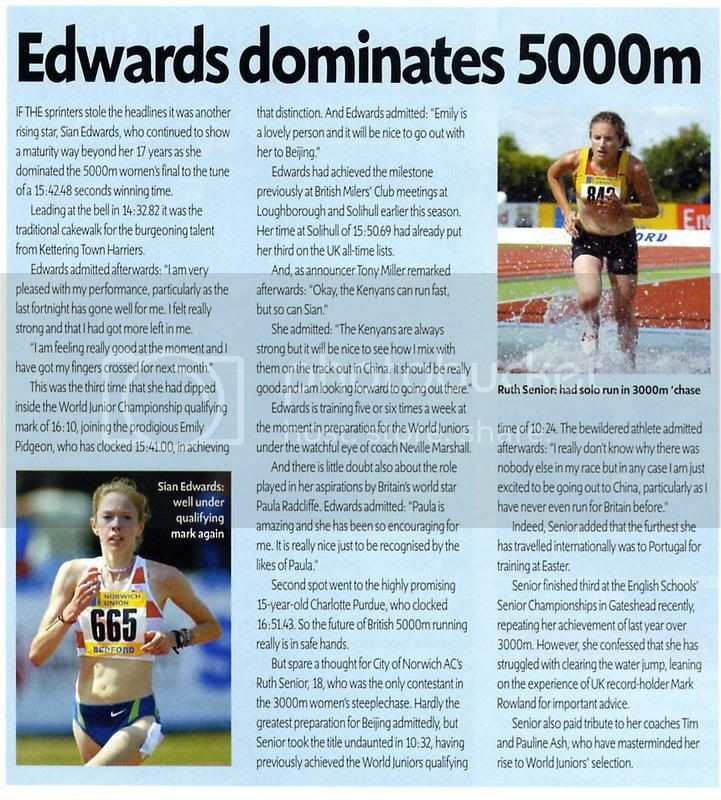 Having just moved up to the Under 17 age group, Sian Edwards was perhaps the surprise package, not herself expecting for more than a top ten finish. Pre-race: The leading Under 17 in the race who is eligible for selection could be Sian Edwards (Kettering Town Harriers), who was first Under 17 and second overall in the combined Under 20/Under 17 race in Birmingham. 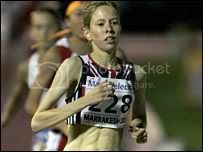 Reebok UK Inter-Counties Champion Sian Edwards (Kettering Town Harriers) also ran above expectations, taking 34th place in 22:45. The 16-year-old Kettering Town Harrier, coached by Neville Marshall, was the youngest member of last year’s silver medal-winning British team at the European Cross Country Championships. 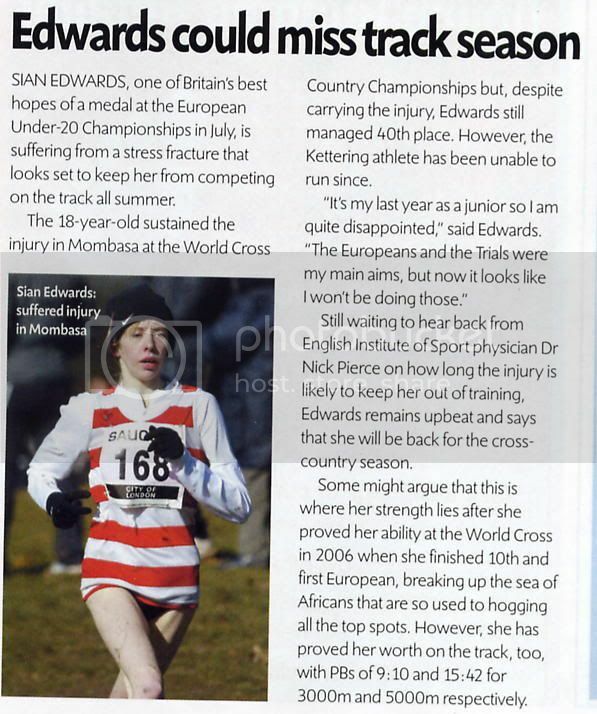 Edwards, who was watched by her parents Phil and Alison, said she had recovered from a poor start, when runners began to pass her on both sides. 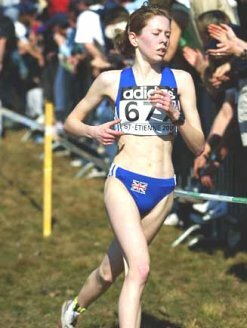 “It was boiling,” said the 16-year-old, who won her Inter-Counties title in a freezing blizzard in Nottingham a fortnight ago. 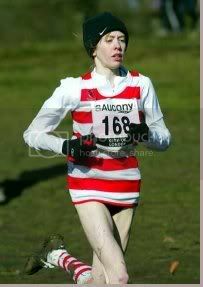 “It was so different from running cross country in England, with all that snow. 16-year-old Sian Edwards (Kettering Town Harriers) – one of the athletes being helped by Dame Kelly Holmes through this season – won the Midlands Under 20 title in 9:27.69, inside the UKA qualifying standard of 9:30.00 for both the Euro Juniors and World Youth Games – and the second-fastest time ever by a UK Under 17. Pre-race: Emily Pidgeon will be the overwhelming favourite even though the field includes European Junior 1500m Champion Morag MacLarty (Central AAC), who won at the Birmingham Cross Challenge at the start of this month and was last weekend named Scotland’s Athlete of the Year; in-form Nicola Sykes, who set a course record in leading Bedford and County AC to victory at the ECCA Relays Championships a fortnight ago; and several members of the squad being mentored by Olympic double Champion Dame Kelly Holmes including Charlotte Browning (Aldershot, Farnham and District), Dani Christmas (Crawley), Sian Edwards (Kettering), Hannah England (Oxford) and Non Stanford (Swansea Harriers). 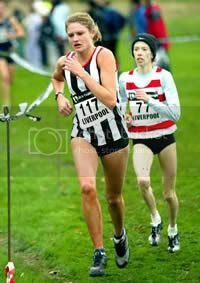 Sian Edwards' fourth place at Liverpool, achieved despite immense pressure from Gemma Turtle, means that she is returning towards the form that earned her Norwich Union GB places in both of last winter's major champs after a couple of less satisfactory races. Pre-race: Only six athletes survive from the 24 athletes who helped make history at last year’s Championships when Norwich Union GB became the first team ever to win medals in all four races. 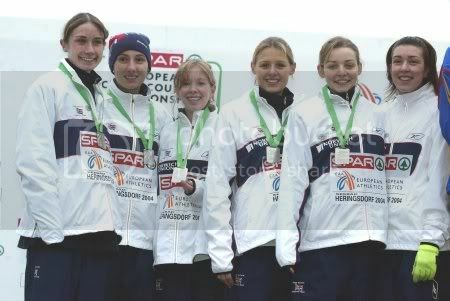 These include Sian Edwards, who was in the Junior Women’s team that won Silver. 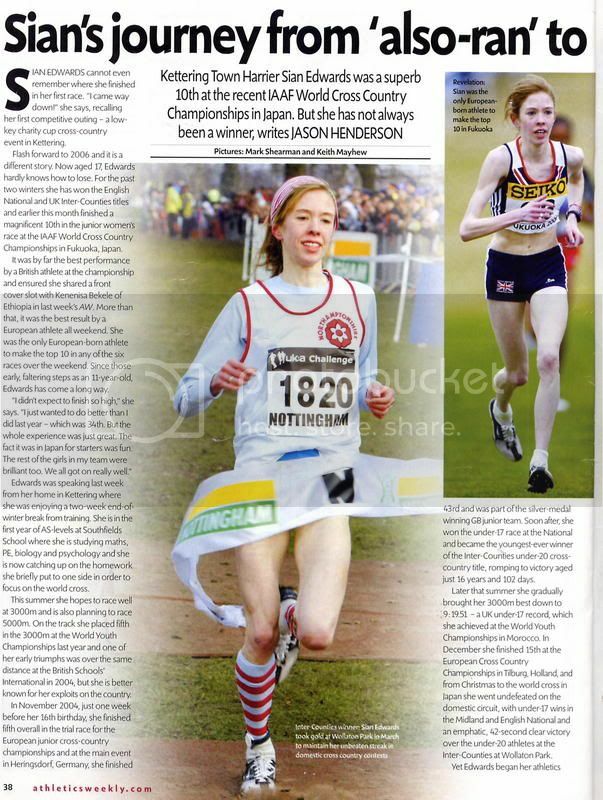 Kettering Town Harriers’ Mighty Atom, 17-year-old Sian Edwards finished a superb tenth to lead Norwich Union Great Britain and Northern Ireland to fifth in the Junior Women’s Team competition at the IAAF World Cross Country Championships in Fukuoka, Japan, on Saturday 1 April. 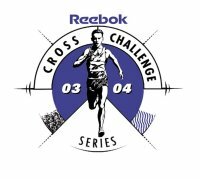 Only in the Paula Radcliffe years of 1991 and 1992 have GB Juniors finished higher as a team in this, the toughest foot race yet invented for teenagers. Today’s performance on a hard, stamina sapping course dotted with steep hills and sharp turns, represents an encouraging improvement on the last two years: Norwich Union GB Junior Women’s Teams were 11th in 2004 and eighth in 2005. They went into action spurred by messages of encouragement from Dame Kelly Holmes and the GB Juniors ‘On Camp with Kelly’ in Melbourne – and responded magnificently to team instructions. 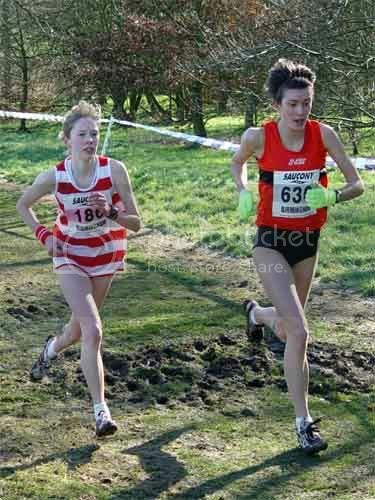 Edwards, the UK Inter-Counties and English National Under 20 Champion, improved from 34th in last year’s World Cross in France with the kind of relentless power that belies her slight frame. She was the leading European over the finishing line on the tough Umi-no-Nakamichi Seaside Park course, nine places and 36 seconds clear of her nearest rival from this continent. 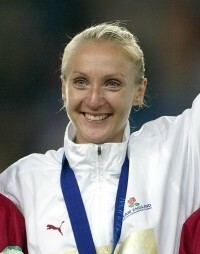 She also defeated the entire Japanese quartet that took the Team Bronze medals. As usual, the 6km race was dominated by African athletes with Kenya taking all three individual medals. Pauline Korikwiang won in 19 minutes 27 seconds in a sprint finish against Veronica Wanjiru with Mercy Kosgei third in 19:45. Edwards’ time was 20:10. Kenya took the Team Gold medals with only 10 points. 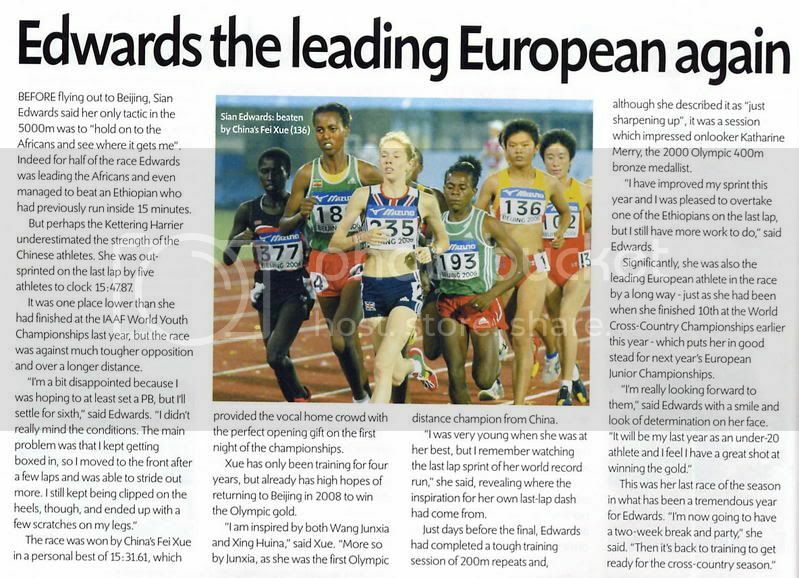 Ethiopia were second with 29, Japan third with 58, Eritrea fourth with 83 and Norwich Union GB fifth with 116 – 17 points ahead of Russia – thanks to Edwards being supported by Stephanie Twell (Aldershot, Farnham and District AC) 31st in 21:14; Non Stanford (Swansea Harriers) 37th in 21:24; Danielle Sale (Orion Harriers) 38th in 21:24; Jessica Sparke (Woodford Green with Essex Ladies) 44th in 21:41; and Joanne Harvey (Exeter Harriers) 51st in 21:59. Edwards ran the kind of aggressive race that has become her trademark this winter. After the opening charge from the starting pens, she was 19th at the first electronic checkpoint but only two seconds behind the leader. At the halfway point, she was 12th in 9:27. At the third checkpoint, she was up to 10th in 16:12. From there, she hung on magnificently to hold off a concerted challenge from the home team cheered on by their supporters. Norwich Union GB Junior Women’s Team Leader Stella Bandu summed-up: “Sian showed an awful lot of confidence and determination, She was not fazed by anything at all. It was great to see her that high up in the race. She joins a very select group. 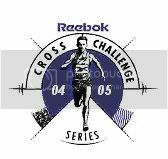 “The whole team did absolutely fantastically in a highly competitive race. By finishing fifth, they have beaten a lot of very good teams. It’s been a real privilege to be their Team Manager and I hope what they have gained from this will help them towards fulfilling their long term goals and potential. It’s been a good learning experience. UK Athletics (UKA) says the World Cross Country Championships are still important to Britain, despite poor results in Japan at the weekend. The championships are not one of the main global targets identified by UK Sport, but UKA Performance director Dave Collins says they are of value. "It is a fantastic way to help youngsters come through," he said. One of those youngsters was Sian Edwards, 17, who finished 10th in the 6km junior women's competition. The Kettering runner was the first non-African athlete over the line in Fukuoka. 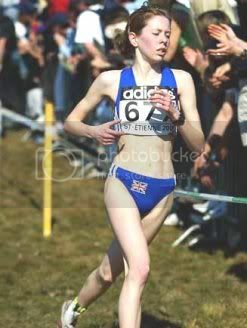 It was the best result for a British junior since 1992 when Paula Radcliffe took gold and Jenny Clague finished fourth. The junior team and the senior women's 8km racers had the best performances of the European teams in Japan, finishing fifth and seventh. 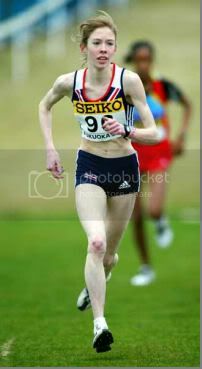 Sian Edwards also shrugged off the damp conditions to record a stunning victory in the 5,000m. The 17-year-old, making her debut over the distance, won in 16 minutes 00.18 seconds to move to fourth on the all-time UK rankings. 'I knew Sian was there so I upped the pace in the last few laps, and still felt strong at the end,' said Pidgeon. Sian went third on the UK junior all time lists with her big PB of 15:50.69, also well inside the Beijing qualifying mark of 16:00.